Show off just how organized you are using Wood Display Racks at any event. 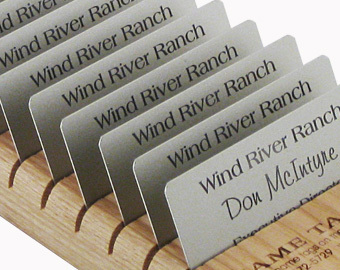 The slanted slots make it so easy to read each name tag that you will have them distributed in no time. Sort name tags or name badges in alphabetical order or however you want. These trays will make any registration run so smoothly, you will want them at every event. Each display rack has a laser engraved Coller Industries brand on one end. However, if you need a plain rack, contact customer service. Orders received after 11 a.m. Mountain Time will be processed the next day. NOTE: The price calculator shows the total cost of this order. Shipping costs shown in shopping cart may be SIGNIFICANTLY understated for multiple units and/or expedited shipping. A customer service representative will contact you with the correct shipping amount if this is the case.